By Dan Ambrose: The red-haired former WBA/WBC light middleweight champion Saul “Canelo” Alvarez (42-1-1, 30 KO’s) will reportedly be fighting #7 WBA Alfredo Angulo (22-3, 18 KO’s) on March 8th on Showtime pay-per-view, according to Fightnews. This isn’t really unexpected, because the only other fighter under serious consideration for the fight was IBF junior middleweight champion Carlos Molina, but they likely rejected him due to him not being well known among casual boxing fans and because of his fighting style involving lots of holding. Angulo gives Canelo a better chance of winning and looking good in doing so than if Canelo were to fight Molina. A Canelo-Molina fight likely would turn into 12 rounds of constant grappling a lot of head-butts. Canelo, #2 WBC, #3 WBA, #12 IBF, is coming off of a loss to Floyd Mayweather Jr. from last September in Las Vegas, Nevada. Mayweather did a great job of out-boxing Canelo, and exposing him as a flat-footed fighter in capable of handling movement or hand speed. Canelo made the mistake of trying to take a couple of rest breaks in that fight along the ropes, and Mayweather really pounded the 23-year-old on both occasions. It’s going to be a really tough ask for Golden Boy Promotions to try and get the boxing public to pay to see Canelo fight Angulo, because this simply isn’t a PPV worthy fight. Both guys are coming off of losses, no titles will be on the line, and Angulo essentially quit in his last fight against Erislandy Lara. I can see Golden Boy asking the public to pay to see Canelo fight if he were facing Lara or someone like Demetrius Andrade, but not Angulo. This is more like an undercard fight as far as I’m concerned. It’s a mismatch for Canelo unless he’s lost his confidence from the Mayweather fight. If Golden Boy wants to turn Canelo into a legitimate PPV fighter, they’ve got to start matching him a little tougher. 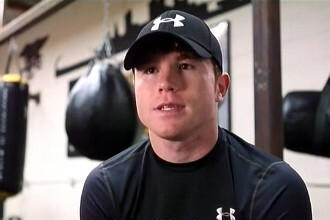 The Mayweather fight was a good start, but this is a backwards step for Canelo. They should be putting him in with Lara, Vanes Martirosyan or Andrade. Angulo is someone that has already been exposed many times, and it’s not interesting to see Canelo fighting this guy, especially with it being a PPV fight.